The Kentucky Department of Education's Pupil Transportation Branch is dedicated to the safe transport of Kentucky's school children. Kentucky Department of Education Driver Training Program - ​The Pupil Transportation Training Program currently has 692 state certified driver training instructors who are responsible for training approximately 11,400 certified school bus drivers statewide. School Bus Safety - Kentucky Department of Education - Every day in Kentucky, 9,822 school buses transport over 385,000 students on school buses. As part of our safety awareness campaign in Kentucky the Kentucky Department of Education (KDE), along with Paula Allen who is a Kentucky School Bus Driver Trainer, has put together a packet to help spread safety awareness. The Kentucky Office of Highway Safety and the Kentucky Department of Education ​have teamed up to create the Kentucky Stop Laws Graphic which explains when to stop for a school bus. NAPT...Bullying Two training modules were jointly created by NAPT, the Education Department's Office of Safe and Drug-Free Schools and the Safe and Supportive Schools Technical Assistance Center. The National Highway Transportation Safety Administration has a webpage dedicated entirely to School Bus Safety. It includes useful tips for increasing school bus safety along with many other resources geared toward school transportation. National School Bus Safety Week – National Association for Pupil Transportation - is always held the third full week in October. The resource guides and activity booklets can be used to reinforce each year's theme. Free School Bus Driver In-service Safety Series - The NHTSA (National Highway Traffic Safety Administration) has available a free school bus driver in-service training series. 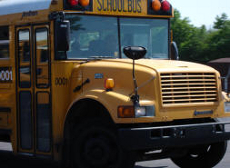 This series of refresher trainings comprises nine programs on driving a school bus. The nine programs are; Adverse Weather, Driver Attitude, Emergency Evacuation, Highway Rail Grade Crossings, Know Your Route, Loading and Unloading, Student Management, Students with Special Needs, and Vehicle Training. … . This refresher … which is frequently requested by school bus drivers and pupil transportation supervisors. …. The intended audience is experienced school bus drivers. This is an in-service training program, not a training program for new drivers. NHTSA has also posted - Child Safety Restraint Systems in School Buses - Six modules covering the basics of child safety restraint systems (CSRS) include specific information on rear-facing and forward-facing seats and safety vests. The training is available in English and Spanish and is intended as an introduction to proper use of CSRS in school buses and as a refresher overview. Back-to-School: Hop on the bus, Gus, with these safety tips ConsumerReports.org - School bus safety is—if you'll pardon the pun—a two-way street. Take some time to teach children the do's and don'ts of riding the school bus.